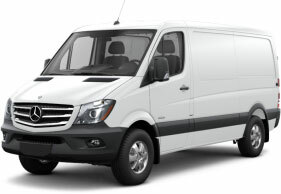 From the defined exterior to the spacious customizable interior, the Mercedes-Benz Sprinter Cargo Van is the commercial vehicle of choice for business owners in Orangeville and the Greater Toronto Area. Featuring three roof heights, three wheelbase lengths, and an available 4×4 drivetrain for improved grip and handling on all road conditions, the Sprinter Cargo Van is endlessly customizable to suit the unique needs of your business. Explore the Sprinter Cargo Van at Mercedes-Benz Brampton, and learn how you can become a Preferred Customer for additional benefits. The standard 4-cylinder BlueTECÒ Turbocharged diesel engine of the Sprinter Cargo Van brings you two-stage turbocharged power while generating 265 lb-ft of torque. Paired with an impressive 7-speed 7G-TRONIC™ transmission that delivers longer service life and reduced engine noise, you’ll enjoy durability and up to 18% greater fuel efficiency in one compact package. The 6-cylinder BlueTECÒ turbocharged diesel boosts your power to 325 lb-ft across a broad rpm range, with peak torque coming in at a low rpm so the V6 engine provides ample pulling power in all conditions, especially when under a heavy load—exactly when it matters most. To tackle challenging weather and road conditions, the on-demand all-wheel drive of the 6-cylinder 4×4 helps maintain stability by applying electronically controlled adaptive torque distribution to each wheel, so you’ll hit the road with complete confidence. The superior craftsmanship of the Sprinter Cargo Van is obvious from every angle, from the sharp contoured headlights to the to the chiseled bumper in back. The interior provides refinement and comfort for you and your employees; you spend hours every week in your commercial vehicle, you deserve to have an efficient and ergonomic environment to make driving an enjoyable experience. The optional multi-function steering wheel puts many vehicle features right at your fingertips, while the bold gearshift level and high-gloss panel provide a striking appearance. What’s more, convenient dashboard storage provides a safe and organized place for accessories you want to keep within arm’s reach. In fact, the entire cockpit combines high style with ease of use. The vertical walls and tall interior standing heights are the ultimate foundation to build your business transportation, while MasterUpfitters can easily transform the interior space of your Sprinter Cargo Van to create the perfect solution to your work needs. The Sprinter Cargo Van is loaded with Mercedes-Benz proprietary safety features to keep all four wheels safely on the road. Load-Adaptive ESP™ is standard on all Sprinter Vans, taking into account vehicle load and center of gravity, it automatically reduces engine power and brakes individual wheels to stabilize the vehicle when wheelspin, oversteer, or understeer are detected. Now standard on all Sprinter Vans, Crosswind Assist™ utilizes gentle, course-correcting brake application to stabilize your Spinter Cargo Van from strong gusting winds when traveling at highway speeds. Whether from passing trucks or changes in landscapes, Crosswind Asist™ quickly intervenes to keep you on course. For enhanced safety, available features like Lane Keep Assist™, Blind Spot Assist™, and Collision Prevention Assist™ compliment the standard features of your Sprinter Cargo Van for the utmost in safety. 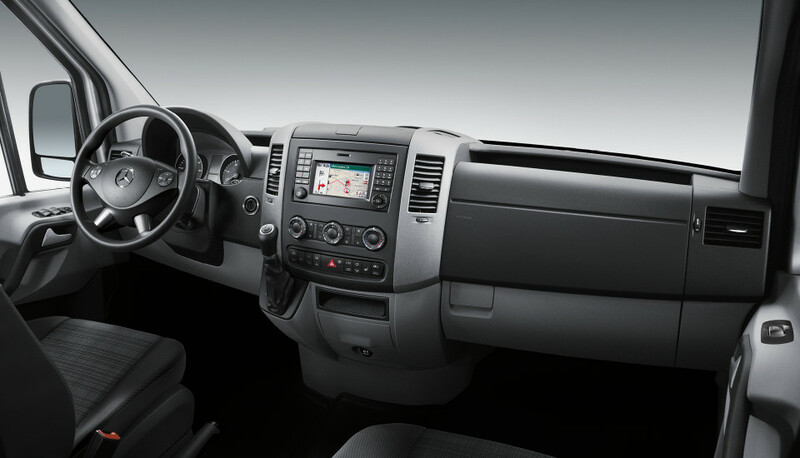 Each Sprinter Cargo Van is loaded with a color display, Bluetooth™* connectivity for using the phone and wirelessly streaming music, as well as a USB connection and iPod® interface. Choose the available Becker MapPILOT™ Navigation system and the instrument and radio display integrates navigation functions to guide you along your way. For a clear view of obstacles behind you, and to safely reverse with confidence, opt for the available back-up camera. 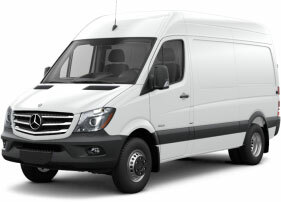 Cargo Van 2500 – The Sprinter Cargo Van 2500 has three available roof heights: Standard, High, and Super High, to best accommodate your interior vertical needs. Three wheelbase options, 144 inches, 170 inches, and 170 inches extended, provide flexibility in cargo volume, and each are available with 4×4 for superior grip and handling in a variety of terrain. Cargo Van 3500 – The 3500 improves upon the 2500 for even greater maximum payload when you’ve got a lot to haul. Available in High and Super High roof heights for superior interior standing height, and with three wheelbase options, each available standard or with 4×4 drivetrain for improved traction on all surfaces. Loaded with the features and options discerning Orangeville business owners demand in their commercial vehicles, the expansive lineup of Sprinter vans is now available for your driving pleasure. 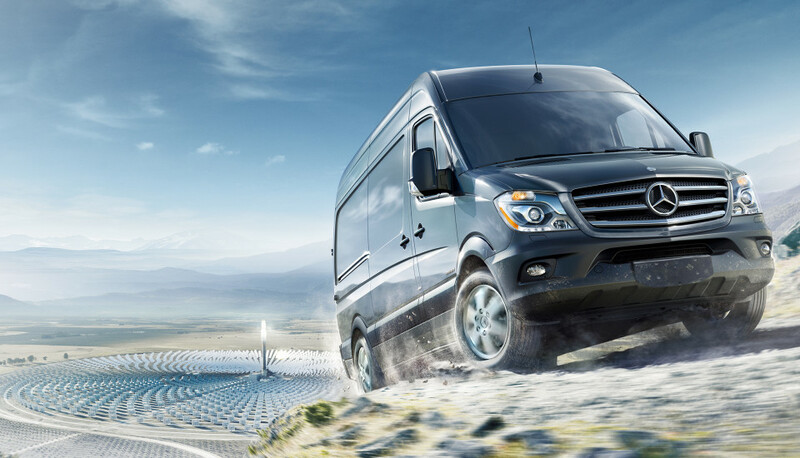 Drivers are invited to visit Mercedes-Benz Brampton, conveniently located in the Greater Toronto Area, to take a test drive and experience the Sprinter Cargo Van for themselves, or get the process started by applying for financing online. Endlessly customizable, you’re sure to find the model that’s a perfect fit for your business needs.